Volume III of Mark Twain's notebooks spans the years 1883 to 1891, a period during which Mark Twain's personal fortunes reached their zenith, as he emerged as one of the most successful authors and publishers in American literary history. During these years Life on the Mississippi, Adventures of Huckleberry Finn, and a Connecticut Yankee in King Arthur's Court appeared, revealing the diversity, depth, and vitality of Mark Twain's literary talents. With his speeches, his public performances, and his lecture tour of 1884/1885, he became the most recognizable of national figures. At the same time, Mark Twain's growing fame and prosperity allowed him to plunge deeply into the business world, a sphere not suited to his erratic energies. He created the subscription publish firm of Charles L. Webster & Company, Which published the most profitable book of its time, the Personal Memoirs of U.S. Grant. And he became the primary financial support for the ingenious but imperfectible Paige typesetter. Within a few years both the publishing company and the typesetter had taxed Mark Twain's patience, and pocket, beyond endurance. The near bankruptcy of the publishing firm and the debacle of the typesetter scheme finally resulted in 1891 in a drastic decision--to leave the house in Hartford, Connecticut, which had long been the symbol of Mark Twain's rising fortunes and idyllic family life, and move to Europe for an indefinite period in the hope of reducing the family's living expenses. The Clemens family would never return to the Hartford house, and the European stay would lengthen into an almost unbroken nine years of exile. Mark Twain's notebooks permit an intimate view of this turbulent period, whose triumphs were tempered by intimations of financial disaster and personal bitterness. 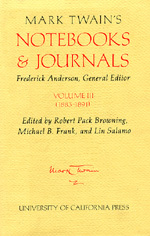 The late Fredrick Anderson was the General Editor for The Mark Twain Papers and for the Iowa-California edition of The Works of Mark Twain. Robert Pack Browning, Michael B. Frank, and Lin Salamo are members of the staff of the Mark Twain Papers in The Bancroft Library at the University of California, Berkeley.